It’s time for another edition of, Flashback Friday! Today, we are flashing back to one of Il Volo’s PBS events to promote Notte Magica with the help of Joan Brenin, who went to the Miami event. Enjoy! Better late then never !! I am posting yet another PBS Experience !!! Mine !!! December 2, 2016 was a very memorable night at the WLRN PBS Studio in Miami !!! 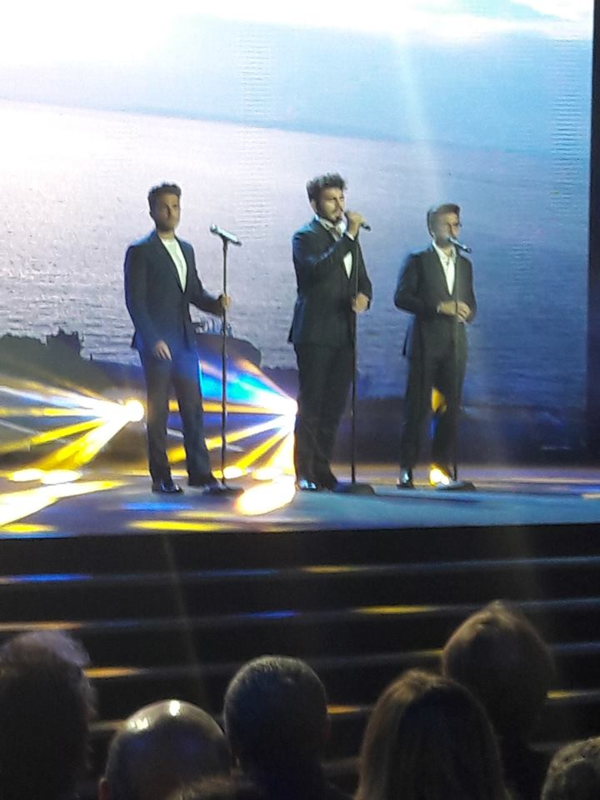 Gianluca, Ignazio and Piero were there to promote Notte Magica !!! And myself,Debbie Gastauer and Vivian Liebgold were also there to attend an Interview, Reception and M&G with our guys !! We arrived 45 minutes before the doors opened, but the wonderful people that work there saw us standing outside and and let us in!! After they checked us in, they showed us the studio where there were candlelit tables that sat four in a nightclubish atmosphere. About fifty people were there to see them including many from the Il Volo Miami Fan Club, including Diana Ramirez Velasquez, who interviewed them along with WLRN’s delightful Mia Lorenzo. Our handsome trio finally walked into the studio graciously greeting each of us as they took their positions on stools set up on a low platform directly in front of us !! We watched their interview which was awesome!! 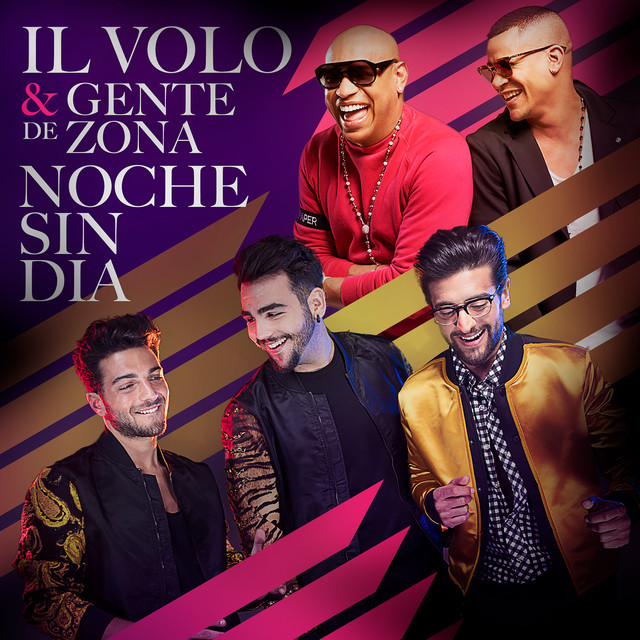 Ignazio was not feeling well that evening but rose to the occasion, and they were all very relaxed, engaging, animated and fun!! Afterwards we had our photos taken with them. I walked in front of Ignazio to stand next to my Gianluca, and he said, “No!! No!! No ! !” and pulled me over to him!! However I still managed to keep my arm wrapped around GG’s waist!! It was really funny!! They were their sweet, kind, charming selves, and we were able to spend quality time with them for another two hours in a very relaxed atmosphere without security shooing us away which was absolutely incredible!! It was by far the longest and most fun M&G ever!! PBS also served us a delicious buffet dinner!! It was a party for sure and a very memorable evening that we will never forget!! A couple of weeks later, one of the young women who works at the PBS studio and who I befriended kindly sent me and Debbie discs of the interview from that night which are now a treasured memento!! We left the studio late for our 1 1/2 hour trip back home, but we didn’t want our exciting night to end so we went to McDonald’s near Vivian’s home so we could rehash our extraordinary evening over coffee!! It was by far the longest and most fun M&G ever!!! The “ WIND MUSIC AWARDS” and some other thoughts for this summer of Il Volo 2017. I was pleased to view the “Wind Music Awards” presentation today and to see that our group, Il Volo, was presented with an award honoring the fact that their Notte Magica has achieved a Platinum album level of sales (meaning sales of a miniumum of 50,000). Also, in this category, Amazon lists “Notte Magica” as number one in sales. There are also some other awards they have won this year having to do with sales and honoring the fact that they are the best Goodwill Ambassadors that Italy has ever had to the rest of the world. During the presentation the guys sang Nessun Dorma again, which makes sense since this song has a very, very wide audience around the world – opera lovers or not. But only one song is not a good way to judge a singing performance. Usually we have 15 to 20 songs to use for source material, but I will say that the guys’ singing artistry was very fine as usual. If I were to make one tiny comment it would be that they sounded a little tired – vocally – which makes perfect sense. After all they have been on tour ever since the last part of January with only a few short breaks and further more they have more to do yet up to near the end of July. That is a lot of concerts. One good thing I noticed when they started here in the USA in February was that they are avoiding having two or more concerts back to back to back. That sort of poor planning really hurt them during the 2013 Latin America tour. If you play Trumpet and break it then you can go out to a store and buy a new one but if you ruin your voice you cannot go to the store and buy a new one. The human voice is very resilient, but sometimes we push it too far and it does not bounce back fast or, maybe, at all. The Latin singer Jose Jose is an example of that sort of thing. He can never sing again – ever. You may remember that for the Latin Grammy awards show a few years back the boys sang Jose’s “El Triste” on a program where they were giving him an honor. He received the award and could barely talk – sounded like gravel – too much over singing, too much booze, too much drugs, and too much bad living. Thus, Il Volo sang his song for him. I have written about this already, but want to share it again. When the boys came to Las Vegas this March they had been already fighting the desert-dry throat since Los Angeles so here our people made sure that there was humidity on stage and plenty of water bottles. My point is that because of taking good care of themselves, vocally, they sang one of the best concerts of the whole USA tour. This sort of thing has to be handled and taken care of from one moment to the next through all 2 ½ hours of the concert. But these guys are very smart about handling themselves. I sat in the front row and (as a vocal coach) admired tremendously how well they adapted. The singing was SUPERB! Less well trained singers would have coughed or broken phrase or sang out of tune. I know because I have heard some very famous singers give way to exactly that. But not our boys. They had it under control from beginning to end. This is what professional singing is all about. Not just the money. All that and the fact that this program is THE most demanding set of songs that they have ever put together for a concert. The famous tenors did this program when they were in their 50s, but our boys are doing it in their early 20s. Bravo ! We need to hope that they keep this pacing steady as they head into the next batch of concerts. I am so proud of these guys. On the 2nd day of their performance, the guys did a “360 loop,” opting for a change in dress from their formal wear for Nessun Dorma, to a more comfortable leather and jeans, to sing their cherished hit, Grande Amore! The guys didn’t miss a beat, battling downpours of rain – even stepping out from the stage to get a little wet – all for the love of their fans! The concerts from May 2016 to May 2017 are taken into account. I believe, but it is my opinion that only Italian concerts are taken into consideration, at that time (2016) the concerts in Italian palasport had already been made, only Florence And Verona that you also saw (6000 + 12000) then concerts in 2017 in Italy but only until May, so the major ones were Torino 11.000 milano 11.000 Verona 24.000 (both night) Roma 12.000 (both nights) then others have more capes small Ancona, Roccaraso Livorno and Bologna. Last night they were good, admirable for being differentiated from the rest of the performances and also brave to bring a piece so busy on a very light evening. They have shown yesterday that they are serious professionals, elegant, mature at their age. Today they are three boys in jeans and leather jackets, show their age, have been addicted, certainly more suitable to this type of audience, they were cool and nice. They sang under a rain shower and Torpedine accompanied them to the drum. Bravo in both cases, have shown two faces of IL VOLO, they can do it. Thank you to Daniela who sent us the link to the show! Watch it before it is gone! Here they are singing Nessun Dorma! A little sad… this is from 2015 – listen how the crowd sings along 2 years ago! I think this is so cute – they are all looking at the award at the same time, the same way! The last 3 years of memories for the WMA – what will the future hold for them next year? Only time will tell…. Maybe they will win a movie award of some kind for Notte Magica or Un Amore Cosi Grande? We can only hope, but no matter what, they continue to soar upward and onward, setting their own flight path and no one can stop them! Hope you enjoyed this post by Myron with a few bits from Daniela & I. Photo/video credits to all owners….